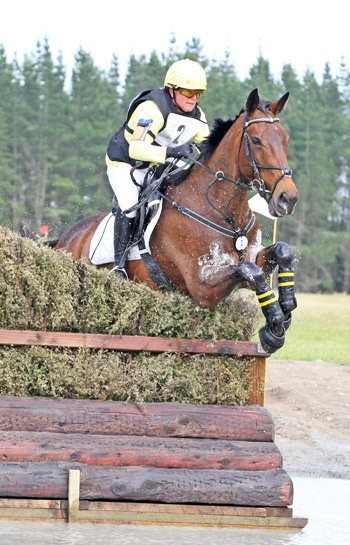 A mere 4.4 penalties separate the to six riders in the CCI3* after the dressage phase at New Zealand’s Puhinui International Three-Day-Event. The field is led by local rider Angela Lloyd on Song, who has a narrow lead from fellow locals Dannie Lodder on Moochi and Simon Gordon on Fletch.com. The ground conditions were testing after a deluge of rain in the past few days. The horses struggled with the soggy footing but at least the sun was out. Gordon, who juggles a full-time job as a financier with his sport, was about to go and walk the cross country course for the first time. He had to work on Thursday so Lodder presented his horse at the veterinary inspection on his behalf. The two are obviously good mates as well as fierce competitors. In the Cato Packaging CCI2*, Donna Smith on Balmoral Sensation has a healthy lead over Virginia Thompson on Star Nouveau and South Islander Clarke Johnston on Leo Degas. Kate Wood from Northland has a 5.2 point lead in the Veterinary Associates CCI*, with Jessica Woods and Sophie Wilkinson second and third. The cross country gets under way with the CCI1* starting at 9am, the CCI2* at 10:45 and the CCI3* at 12.45.